Who does not like bright, juicy and crunchy carrots? This root vegetable can be bought at any store at any time of the year. We are so used to it that we no longer consider it a superfood. And we forget that initially this vegetable was cultivated because of its medicinal properties. Today there are a lot of discussions about the benefits of exotic products. And we forget that such vegetables as carrots, beets or pumpkins are not only useful, but also very accessible. It is not for nothing that carrots are considerted to be one of the most economically beneficial crops in the world. It is strange enough, but the native land of carrots is Persia (namely, the regions of modern Iran and Afghanistan). In these countries there is still the greatest variety of sorts and species. Initially, carrots were grown not for the sake of its juicy roots, but for the sake of seeds and greens. 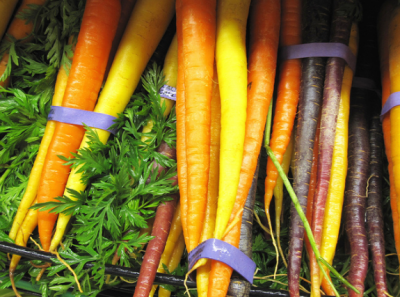 The first mention of the consumption of carrots themselves dates from the first century of our era. Bright root vegetables are widely used in cooking, they are eaten raw, cooked, baked, stewed. They are also used for different pies. In any form, carrots will be of great benefit, since this vegetable is rich in vitamins, minerals and antioxidants, including beta-carotene. According to the content of the latter, the carrot goes only after sweet pepper. In general, carrots are considered to be an excellent dietary product. It consists of water for about ninety percent. One medium-sized carrot contains about twenty-five calories. In addition, soluble fibers, which carrots are rich in, can lower blood sugar, slowing the digestion of sugar and starch. And insoluble fibers promote regular cleansing of the intestine. Did you know that carrots are stuffed with minerals, such as copper, manganese, calcium, iron, phosphorus, potassium and magnesium? As already mentioned, carrots are rich in an antioxidant called beta-carotene, it protects the body from the harmful effects of free radicals, and polyacetylene and falkarinol help in the fight against cancer. Carrots are also rich in vitamin C, one medium-sized root can provide 9% of the daily allowance. Carrot juice is used to treat vitamin deficiency, regulate carbohydrate and mineral metabolism. Doctors recommend using it even in the first days after a heart attack. However, it should not be used by those who have ulcer of stomach . Carrot leaves are also incredibly useful, they contain an impressive list of nutrients, minerals and vitamins. So, thin delicate leaves are rich in selenium, vitamins C, PP, E, D, zinc, phosphorus, iodine, magnesium and potassium, as well as pantothenic and nicotinic acids. Carrot tops have been used since ancient times for the beauty of the skin, nails and hair. It is also used as an antiseptic, for improving blood circulation and stimulating metabolic processes in the body. Tea from carrot tops was used for the treatment of cystitis, hemorrhoids and dermatitis. Carrot top can be added to salads, soups, vegetable stews and casseroles, as well as pickles and marinades, to give them racy taste and aroma. Seeds of carrots are also famous for their taste and healing properties. Since they are rich in flavonoids, which have spasmolytic and vasodilating properties, they are used as the basis of various pharmaceuticals. If you want to get the full benefit of carrots, as well as its seeds and haulms, choose local vegetables. You can buy carrots at fairs and store it for a whole year. It can be stored in the fridge for several months. For a longer period of storage, unwashed carrots should be placed in a wooden box or a conventional bucket and sprinkled with sand or wood shavings and stored at temperatures from zero to ten degrees of heat.